We have yet another winter storm arriving. Some are saying that it is the biggest one we've had in a couple years. There is even lots of comparison to White Juan, a storm that rocked our province in 2004. With hurricane force winds and the possibility of close to 2 feet of snow, a little preparation is needed. Not so much as to what we'll do while we are stuck home for the day but in the event we lose power, our main focus will be to stay warm since electric baseboards are our only source of heat. Put flannel bedding on our bed. Close all curtains to help keep heat in. Keep the heat on over night throughout the whole house. Ask one of the neighbour kids to take care of our driveway. Make sure deep freeze is full. Take out any food that we'll eat that doesn't need to stay in the fridge. Dig out shovel from the shed. Put garbage cans under deck. Plan some new "no electricity needed" activities. Dig out winter jackets and boots. 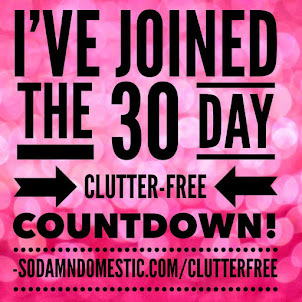 Read some SoDamnDomestic decluttering articles. So hopefully it will just be like any other day at home. If we do lose power, well we'll just make an adventure out of it with lots of cuddles to stay warm!